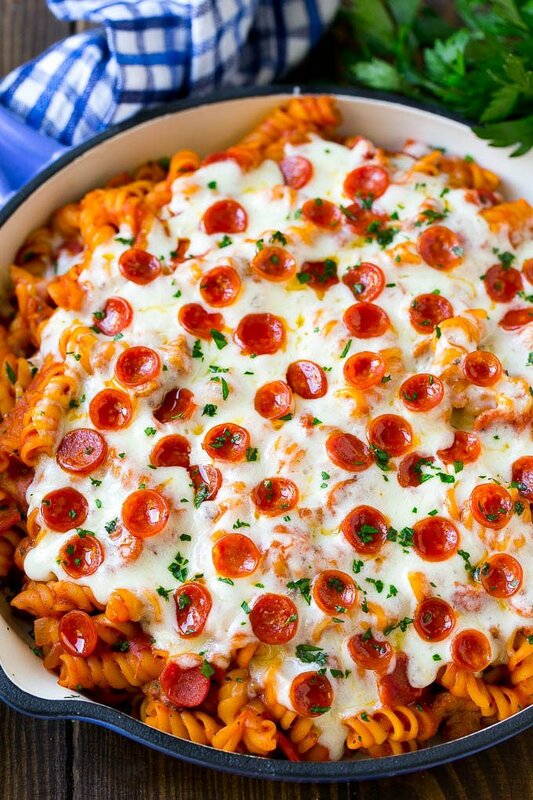 This pizza pasta is a one pot meal made with pepperoni, sausage and plenty of cheese, all mixed with pasta in tomato sauce. An easy dinner that’s family friendly and quick to make! We love all things pizza in my house, including pizza stuffed chicken, pizza dip and pizza muffins. This pizza pasta is our new favorite meal, the kids request it every week and I’m happy to oblige because it’s so quick to make. My kids would eat pizza every day if I let them. But there’s only so many times you can have pizza before you get tired of it, am I right? This pizza pasta is a fun twist on a classic with hearty pasta cooked in a savory sauce, plenty of cheese, and our favorite pizza toppings. How do you make pizza pasta? The first step is to cook up some sausage and onions in a pan. The pepperoni gets added to the pan, along with marinara sauce, water and rotini pasta. Everything simmers together until the pasta is tender. Finally, add a layer of cheese and some more pepperoni and dinner is served! 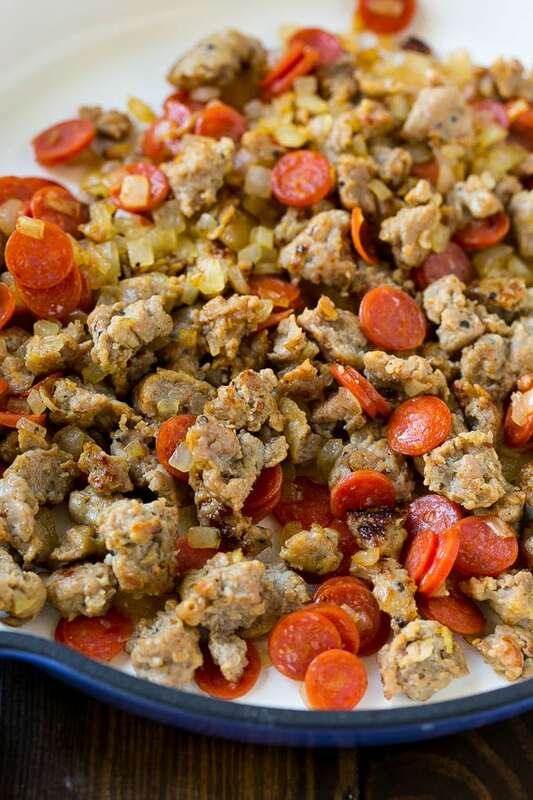 You can use turkey or pork Italian sausage. I use mild sausage, but feel free to use hot if you like spice. Can’t find mini pepperoni at your store? You can use chopped regular sized pepperoni instead. 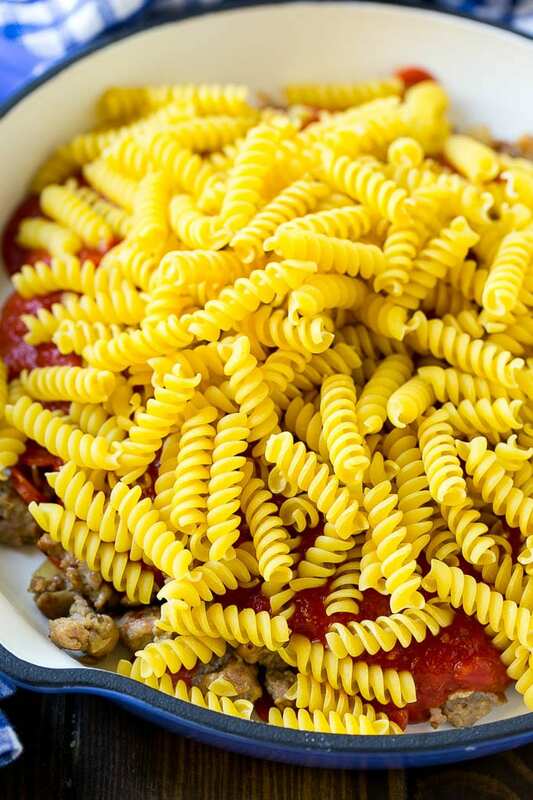 I use rotini pasta, but any short pasta shape will work. Choose your favorite brand of marinara sauce for this recipe. While the pizza pasta primarily cooks on the stove top, you will need to turn on the oven to melt the cheese at the end. Be sure to use an oven safe pan so that you can easily transfer your pan from stove to oven. 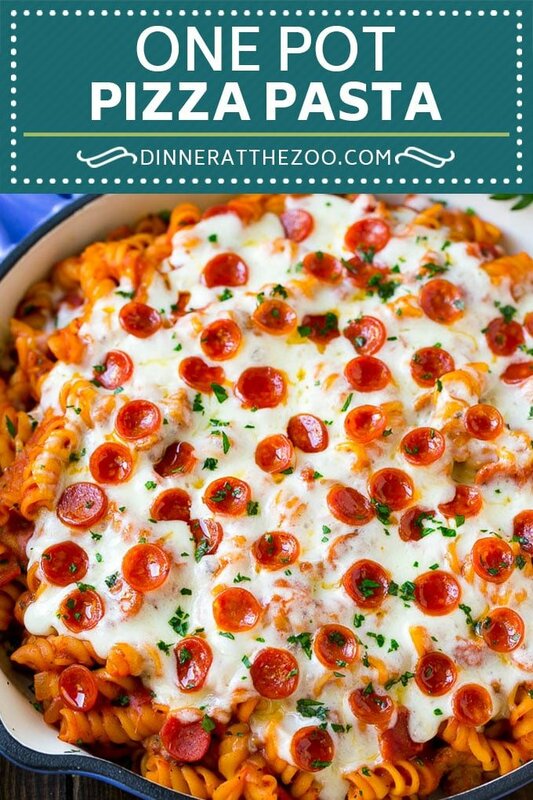 This pizza pasta makes for great leftovers, my kids always ask to take it for lunch the next day. This dish is hearty enough to serve on its own, but if you’re looking for side dish ideas, I’d recommend my garlic knots, parmesan roasted broccoli or candied carrots. 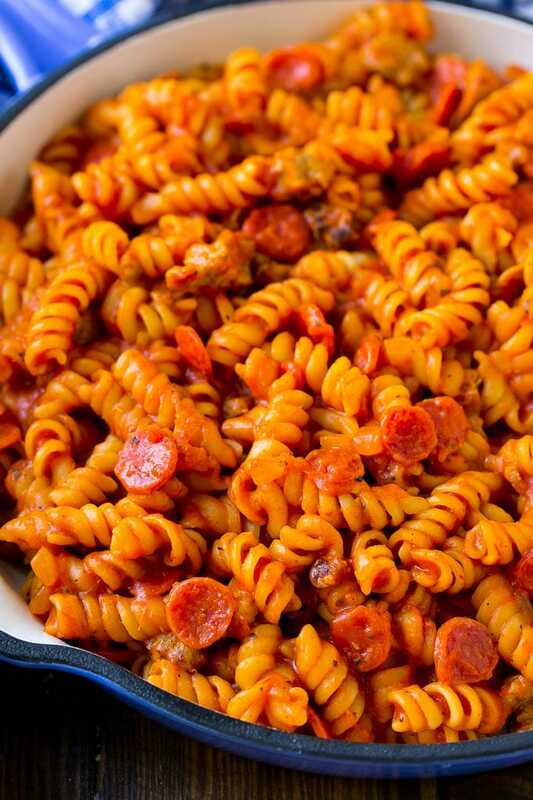 Pizza pasta has it all – it’s quick, doesn’t dirty up a ton of dishes, and has flavors that both kids and adults adore. Make it for dinner tonight and watch the rave reviews come in! 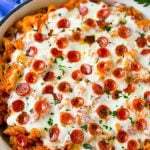 This pizza pasta is a one pot meal made with pepperoni, sausage and plenty of cheese, all mixed with pasta in tomato sauce. An easy dinner that's family friendly and quick to make! Heat the olive oil in a large, deep pan over medium heat. Add the sausage and cook for 4-5 minutes, breaking up the meat with a spatula, until browned. Add the onion to the pan and cook for 3-4 minutes or until translucent. Add 1/2 cup of the pepperoni and the garlic and cook for 1 minute. Add the marinara sauce, water, salt, pepper and pasta to the pot and bring to a simmer. Cover the pot and cook over low heat for 12-14 minutes or until pasta is tender. While the pasta is simmering, preheat the oven to 400 degrees F.
After the pasta is finished cooking, sprinkle the cheese over the top and arrange the remaining 1/4 cup of pepperoni on the cheese. Bake for 4-5 minutes or until cheese is melted. Sprinkle with parsley and serve. Love how you used the mini pepperoni’s in this. I have to do that next time I make pizza pasta. First time for me to learn pizza pasta, what an interesting dishes. Pepperoni is one of my favorite and glad I can use it to topped this dish. Look easy to prepare so I may make this dish next week for our Chinese new year party gathering. Its good to have some western dish as most of my relatives are bring in Chinese food for our potluck party. This just looks so good! What a great family recipe for weekends or weeknights! I want to dig right in! Looks yummy and looks easy to make. I need to try this. We love pizza and we love pasta! So of course, these recipes are perfect for us! What an awesome idea for me to try. My family also loves pasta, pizza anything that has cheese. Looks delicious! Pizza Pasta is something new. Sounds interesting! This Pizza Pasta is such a good selection for me to try out. Thanks for sharing the recipe with us. Omg! Looks so amazing! We love anything pizza! That looks pretty yummy. I love that it appeals to young kids too! My neighbor boys will love this. Hmmmm I’m drooling! 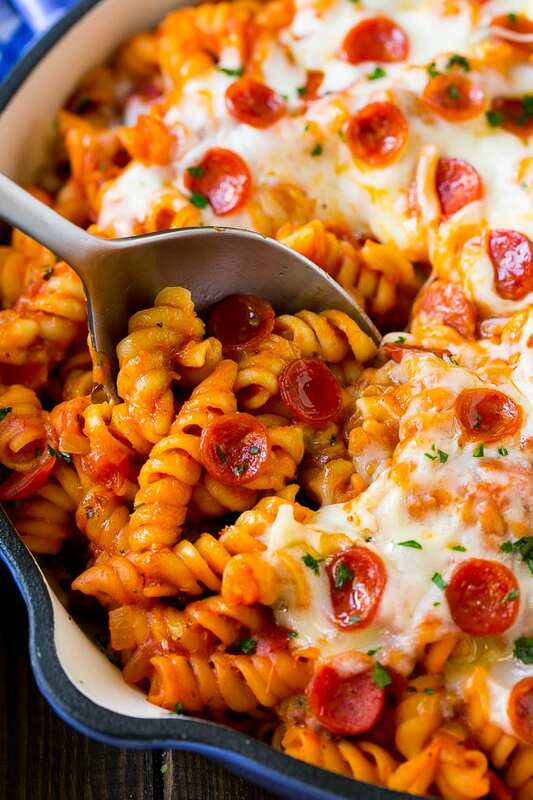 This pizza pasta looks sooooooo delicious. Can’t wait to have a taste.